As the name implies, the book is set in the real life environment of Buffalo’s vibrant Polish-American east side. 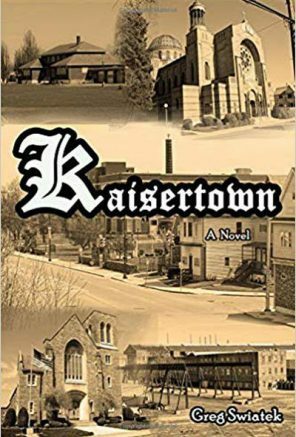 The search for identity amid a clash of cultures and generations marks Greg Swiatek’s new novel, Kaisertown, recently published by NFB Publishing of Buffalo. As the name implies, the book is set in the real life environment of Buffalo’s vibrant Polish-American east side. When Tina Kaszpczyk’s body is found in a field known locally as Okie Diamond, the tightly knit Polish community that was her home is turned upside down. Although domestic violence, drunkenness and street fighting were not uncommon, nothing like this had ever happened before. And, although the police were quick to nab a suspect, they were a long way from solving the crime. Swiatek has set the murder within a collage of interesting and vibrant characters who individually attempt to accommodate themselves to the changing world around them. Trapped between two cultures, each finds his or her own way of coping. Some such as Jason and Dorothy rebel against the church, their parents and neighbors before finding true, redeeming love. Others like Nelly Ostraski escape through pain and acceptance of their lot in life. Jason’s cousin and best friend, Larry, has his own unique release after a stint in Vietnam. Dorothy’s brother Timmy wreaks havoc wherever he goes, all the while Pani Khula weeps and Barney, the saloonkeeper, perseveres. Join these interesting characters and others and take a trip back through Kaisertown. For more information on NFB Publishing, please visit nfbpublishing.com. Be the first to comment on "A murder in Kaisertown is the focus of new novel by Greg Swiatek"